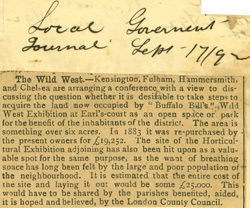 The Wild West.—Kensington, Fulham, Hammersmith, and Chelsea are arranging a conference with a view to discussing the question whether it is desirable to take steps to acquire the land now occupied by "Buffalo Bill's" Wild West Exhibition at Earl's-court as an open space or park for the benefit of the inhabitants of the district. The area is something over six acres. In 1883 it was re-purchased by the present owners for £19,252. 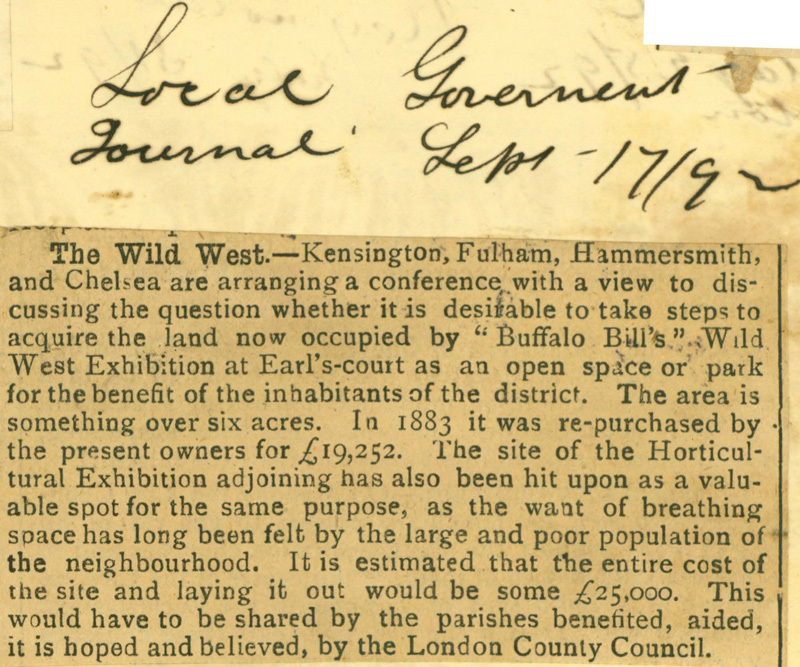 he site of the Horticultural Exhibition adjoining has also been hit upon as a valuable spot for the same purpose, as the want of breathing space has long been felt by the large and poor population of the neighbourhoods. It is estimated that the entire cost of the site and laying it our would be some £25,000. This would have to be shared by the parishes benefited, aided, it is hoped and believed, by the London County Council.